If you’re one of the thousands of students heading off to university for the first time, you’ve probably got an endless list of things to sort out before starting your new adventure. Not only are you starting your studies, you’re likely moving to a new city, new accommodation and making new friends. But in all the excitement, don’t forget about actually getting there. If you’re arriving by car this semester, take the stress out of your journey by following our essential guide to driving to university. Rated 4 out of 5 stars on Trustpilot from over 25,000 reviews. Your car insurance policy needs to be registered to the address you spend the most time living at. If your car is moving with you to university, this means your university address, whether student halls or a shared house or flat. If your policy is currently registered to your parents’ home, you’ll need to contact your car insurance provider and change the address before you set off for university to make sure you stay covered for every eventuality. It’s possible that changing your address could make your premium more expensive, but if you don’t tell your insurer that you’ve moved across the country you risk invalidating any future claims. If you’re in the market for great value car insurance tailored to young drivers, check out the RAC’s range of insurance options. Another must-have before you set off on your trip to uni (or any trip, for that matter) is breakdown cover – because you don’t want your brand new life delayed for anything. Taking your car to university might mean you’ll be spending more time on the road – travelling back and forth from the family home – so it’s also a good idea to revisit what kind of cover you have to make sure it meets your new needs. The good news is that with RAC’s breakdown cover, you can remain on your parents’ policy even if you move into student halls, which takes away the added stress of arranging new cover. If the trip to your new university digs takes you across the country, the best journey preparation you can do is to plan which route you want to take before setting off. If possible, try and travel at quieter times by avoiding the morning and evening rush hours in and around large towns and cities, and those stretches of motorway that can quickly clog up. It’s also a good idea to check out for scheduled road closures and roadworks, and be aware that big sporting and cultural events can also have a major knock-on effect on the roads, so check the RAC Route Planner for the latest news. Helps young and new drivers save money by rewarding safe driving. Another must-do before you set off is to make some quick car checks – you don’t even need to go to a mechanic. The first thing to check is your fluid levels. Do the dipstick test to check your oil level, and take a look at your coolant as well, to make sure your engine doesn’t overheat on the journey. You should also check that your tyres are inflated to the correct pressure, particularly if your car is loaded up with all your worldly goods, while a quick once-over of all your lights is also a good idea whether you’re driving at night or not. Take a look at the RAC’s essential road trip checklist for more crucial car checks. For some people, the drive to university might be their first time driving on motorways. Ideally, you’d fit in plenty of practice beforehand, as there are several important things to remember about motorway driving. Make sure you familiarise yourself with the motorway layout (hard shoulder, verge, faster lanes) and be aware of any speed limit changes throughout your journey. The standard motorway speed limit is 70mph. Make sure you leave yourself enough space in your lane and always be aware of your speed, as it’s easy to lose sight of just how quickly you’re travelling. Be considerate to other road users, particularly at junctions when oncoming traffic is looking for space to merge, and remember that the middle lane is for overtaking, so don’t become a middle lane hogger. 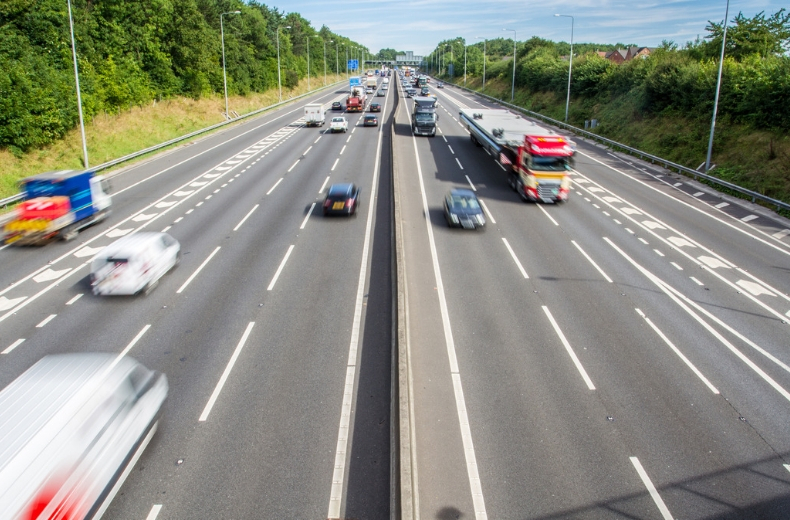 READ MORE: Smart motorways – what are they and how do you use them? If you’re taking all your cherished possessions halfway across the country, it goes without saying to make sure they’re packed safely and securely in your car. For a safe, smooth drive it’s important to maintain an even distribution of weight throughout the vehicle as best you can. Put the heavier items towards the centre of your car and the larger ones towards the back, and don’t stack anything above headrest height because it could impair your vision. Remember, you don’t need to take everything you’ve ever owned with you to university. Less is always more, and sometimes it’s a good idea to start fresh with a new chapter of your life. Whatever you do when it comes to getting yourself to university, make sure you don’t end up rushing. Leave home with plenty of time to spare to help you avoid getting stressed on the journey. You never know what unexpected things the roads will throw up, so leave earlier than you normally would to add a bit of flexibility into your journey. If your journey to university is more than a couple of hours, make sure you schedule in some rest stops to help you recuperate before continuing the drive. The chances are you’ll be full of nervous energy, so the occasional stop off at a motorway service station or somewhere else along the route will help keep you calm and give you time to collect your thoughts. Don’t forget to take along a drink with you for the journey, because dehydration can be just as dangerous as alcohol when you’re behind the wheel. Before you set out, make sure you know exactly where you’re going to park once you make it to university so you don’t spend hours driving around unfamiliar streets looking for a spot. Some halls will provide parking spaces to residents (often with permits which can be readily obtained from the university), while others won’t, which means you’ll have to find an on-street space. If you’re unsure of where you’re going to park, Google Maps should be able to come up with some alternatives so you have an idea of where to head. Finally, the most important thing of all – relax and enjoy! Moving to university can be a stressful time for all new students, so once you’ve made it and moved yourself in, let your hair down and start enjoying all the Freshers Week fun. Did you know, you can get fined for moving out of the way of an ambulance? Want more useful content like this sent straight to your inbox?